Movie: Glory to the Filmmaker! Takeshi Kitano (played by Takeshi Kitano) is mired in a severe bought of writer’s block. He attempts to jump start his next film project by trying various other styles and genres. He first tries his hand at a Yasujiro Ozu like B/W pic, but the narrator (one of Kitano’s own assistants) states, "who wants to watch a boring film about 30 minutes of drinking?" Kitano then tries his hand at a mainstream romance film, but finds the genre just as problematic. 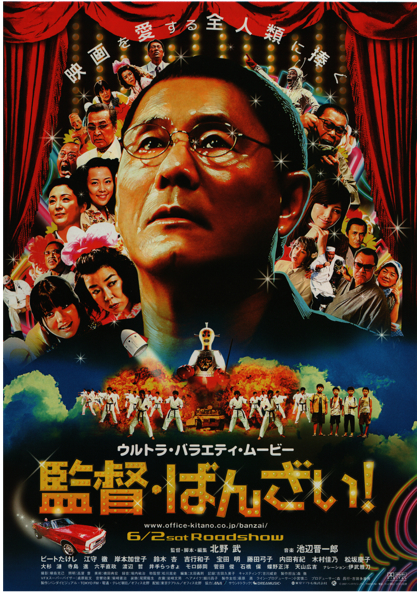 Next up for Kitano would be to jump on the popular retro film bandwagon, but unlike “ Always Sunset on Third Street," Kitano doesn’t whitewash the more desperate moments from that era. Inevitably, he ditches the retro film idea. He then tries his hand at J-horror and martial arts films, but gives up on those ideas well. Finally, he settles on "The Promised Day," a sci-fi action film with heavy CG effects, which quickly morphs into a film about a grifter mom and daughter as they try to marry the daughter off to a wealthy man. Ki Feb 06 2011 5:19 am Takeshi Kitano is no stranger to comedies, but to the more casual viewers, they may only think of Kitano as the guy that makes those slow moving Yakuza films, the ones that lines the aisles of the foreign section at their local Blockbuster video store. In fact, Takeshi Kitano first gained popularity as one half of a stand-up comedy duo known as “Two Beat.” He then went on to international acclaim with his breakout performance in “Violent Cop,” a film marked with long moments of silence and then sudden outbursts of violence. His following films, “Boiling Point” and “Hana-Bi”, would go on to cement his popularity and cinematic style - introspective moments of silence mixed in with sudden outbursts of extreme violence and the occasional humorous scenes. Since that time, the mercurial Takeshi Kitano has made a handful of unexpected films that have received mixed reactions. The running gags placed in the film are hit and miss. The dummy that Kitano carries everywhere, strikes an impressive visual image at first, but gets more tiresome as it’s used in the same type of gags repeatedly. The jokes placed in the various film-within-a-film segments are also hit and miss. The kids featured in "Coal-Tar & Rikidozan" worked well, while the segments on horror and martial arts were dry. When the movie finally settled into a conventional film, a comedy about a mother and daughter pair of grifters, the jokes were mostly off-key. On the positive side, Anne Suzuki played the daughter, and she was able to liven up the liven up the film whenever she was onscreen. Interesting to note that the mother and daughter characters seemed to share strong similarities with the mother and daughter characters in the South Korean film "Dasepo Naughty Girls. " In that movie, the daughter known as "Poor Girl," would walk around with a stuffed figure draped on her back, while she was mired in a poverty with her eccentric mother. There are moments in "Glory to the Filmmaker" where you will burst out with laughter. Most of those moments are placed in the first half of the film, with its unconventional film within a film segments. The second half settles into a conventional film as does the jokes and creativity. During this time, Anne Suzuki does make a welcome appearance in a humorous supporting role. While the film came out firing on all cylinders, "Glory to the Filmmaker" turned out to be a decent comedy, with fun quirky humor mixed in with dry physical comedy. Kitano Takeshi fans should find enough insider jokes in the film to satisfy.